By blending term deposits with bonds, NFPs can increase returns for a slight increase in risk, helping to maximise income that can be used in delivering services, writes head of Middle Markets at FIIG Securities Mathew Simpson. Charities and the broader Not for Profit sector have never been under more pressure to maximise value from increasingly scarce donor capital. This is particularly so for the trustees and treasury managers responsible for investing funds. The options available to these managers can be stark. For some NFPs, the sharemarket has become an acceptable asset class to invest donor capital, particularly those seeking “alpha” – or returns above and beyond a defined benchmark. More often than not, however, donors are uncomfortable with beneficiaries investing in a market that is volatile with the very real risk that a correction or crash could put a significant dent in funds. It goes without saying that losing donor capital before it has even had the chance to do some good is not a good strategy for building a sustainable well governed organisation. 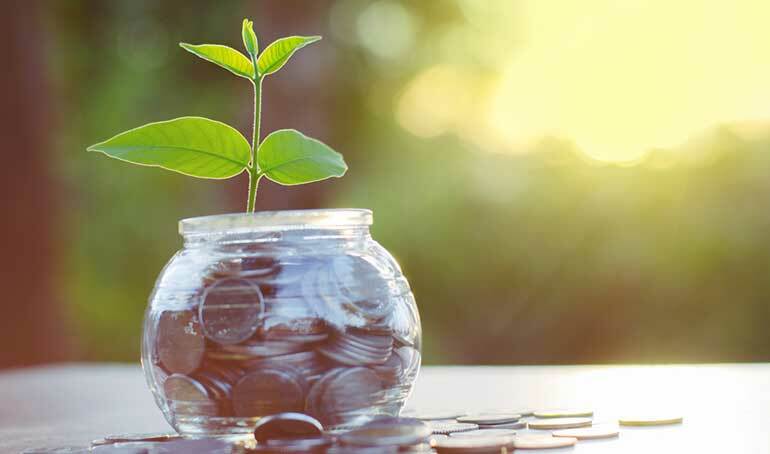 At the other end of the spectrum term deposits have found favour with NFPs as a means to manage risk and maintain liquidity while complying with treasury policy. The highly-predictable, stable and controlled nature of term deposits gives treasurers a high level of certainty. However, this certainty has a price. In a historically low interest rate environment (with little expectation of increases in the near future), the diminishing interest paid on term deposits has forced many to seek alternatives. When considering asset allocation for NFPs, the middle ground between lending money to a bank as a depositor and becoming a part owner of a company as a shareholder is to become a lender to governments and corporates as a bondholder. Bonds originate from all corners of the Australian economy. The Australian Government at both Commonwealth and state levels issue bonds to fund infrastructure and the normal business activities of government. Corporations from the country’s largest banks, miners and insurance companies to smaller companies also issue bonds. In their simplest form a bond is a security that pays a defined distribution (the coupon) for a given period of time (the term) and repays the face value of the security at maturity. Unlike a share, a bond is a loan from an investor to the issuer of the security and is a legal obligation. There are many types of bonds, including fixed, floating, amortising, inflation linked and Eurobonds. 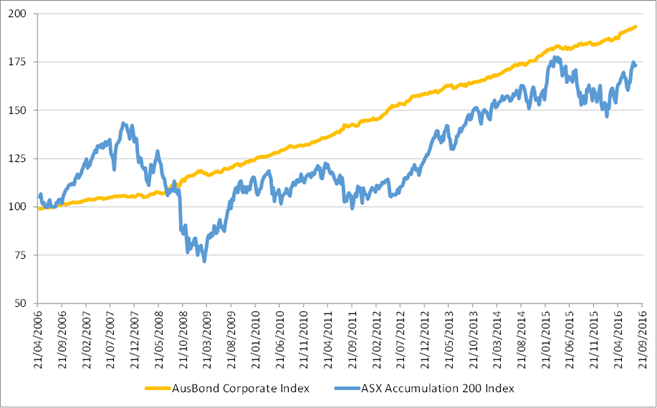 Even though bonds are lower risk than shares, over the last 10 years, bonds have performed better with the ASX Corporate Bond Index returning 7.21 per cent versus the ASX 200 benchmark hitting only 5.48 per cent for 10-year annualised returns in the same period. GRAPHIC Source: FIIG Securities. Accurate as at 12 August 2016. Indexes have been normalised from weekly statistics over 10 years. For a NFP organisation, quantifying the risk of bond investment in line with treasury policy might be new territory, however ratings agencies provide a framework to help assess the risk of default. Typically NFPs invest in bonds rated investment grade (IG) by ratings agencies Standard and Poor’s, Moody’s or Fitch. By blending term deposits with bonds, NFPs can increase returns for a slight increase in risk, helping to maximise income that can be used in delivering services. In some quarters, fixed income investing is referred to as the “defensive allocation” – the ballast to manage potentially volatile investments. For NFPs, bonds have the capacity to provide investment stability along with income to support a conservative, compliant financial strategy. 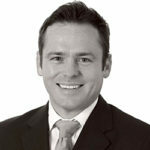 About the author: Mathew Simpson is head of Middle Markets at FIIG Securities. Mathew Simpson is head of Middle Markets at FIIG Securities.